Synopsis: With Voldemort now back in power, The Ministry of Magic is making every effort to dispel rumours of Lord Voldemort’s return, all the while Hogwarts finds itself under intense scrutinisation from the Ministry. Review: The latter years of a person’s time at school certainly have their fair share of difficult situations such as puberty and undergoing the stress of exams, all of which can take a very heavy toll on an individual. 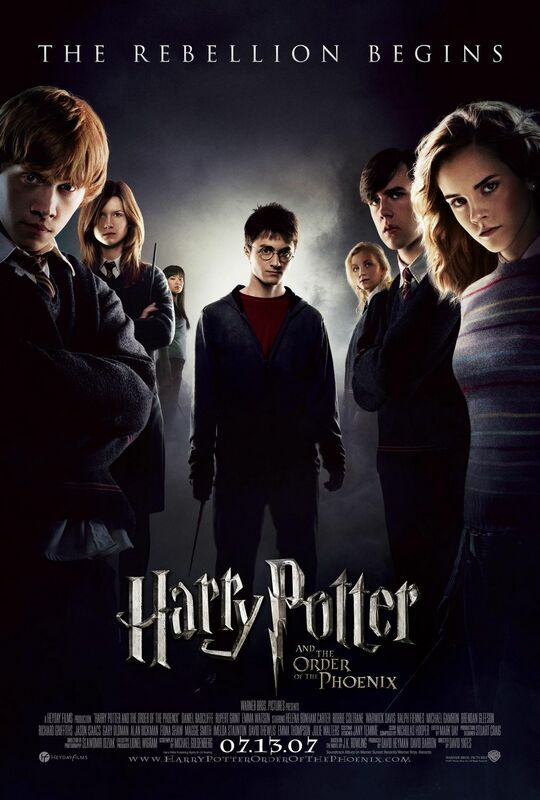 Yet for one Harry Potter, these are somewhat minor when at the end of the last film, he had a bruising dual with the newly risen Voldemort and he must now contend with the fact that the wizard who killed his parents is back and out to get him once more. With every year that goes past for Harry, the mood in and around Hogwarts keeps getting darker, and Harry is becoming a bit detached from those closest to him. And after a bruising hearing before his fifth year has begun, it isn’t long before things at Hogwarts are going a bit wrong, which doesn’t exactly help matters after his brush with death. The Ministry refuses to believe Harry’s claims that the Dark Lord has returned, and this is also applicable to some at Hogwarts. In addition to their refusal to believe Voldemort is back, the newly appointed Defence Against the Dark Arts teacher, Dolores Umbridge is taking matters at Hogwarts into her own hands, and indeed that of the Ministry’s as well. Incoming new director David Yates, along with new screenwriter Michael Goldenberg manage to compress what is the longest of Rowling’s novels into a solid and compelling film, that despite the ever darkening tones and mood surrounding Hogwarts do their best to weave humour into the script whilst also keeping the focus on the core story. By this point you are completely invested in all things Hogwarts and that interest is maintained with more great action sequences. We got a glimpse of an exciting duel between Harry and Voldemort in the previous chapter and there are plenty more brilliant wizarding duels to witness and Yates helms these exciting battle sequences in this chapter with great style as his predecessors such as Newell and Cuaron did. As ever with a new Potter film, there are a number of new additions to the cast, and yet again, the casting is excellent. Of the new arrivals the stand out by far is Imelda Staunton’s Umbridge, a woman of some rather twisted principles who is out to do the Ministry’s bidding. You thought you disliked Voldemort, but you WILL HATE Umbridge. She has such a loathsome on screen presence that it may want you to hurl something at the screen whilst shouting a lot of expletives. It is full credit to Staunton, as she gives the franchise a really memorable antagonist besides Voldemort of course. Also a new arrival for the Dark Lord is Helena Bonham Carter’s crazy (in every sense of the word) Bellatrix Lestrange, a witch and close associate of Voldemort. These ladies are in many ways the stand out performers of a cast of which each and every one delivers a sterling performance. With some dramatic turn of events taking place, the suspense and excitement is maintained throughout through a solid script and excellent directing from Yates. The stakes are getting ever darker in the Wizarding world, and it is certainly gripping to watch these characters that you know and love go through tough times. By this point the Potter machine was casting its all powerful spell on its audience and as the franchise was reaching its climax, the audience were holding on to their metaphorical broomsticks, because as we will find out, things are about to get very interesting at Hogwarts. It’s almost a cliche to say that with each film the Potter franchise gets darker, but there is effective use of humour, all the while ensuring this magical universe gets another compelling adventure.